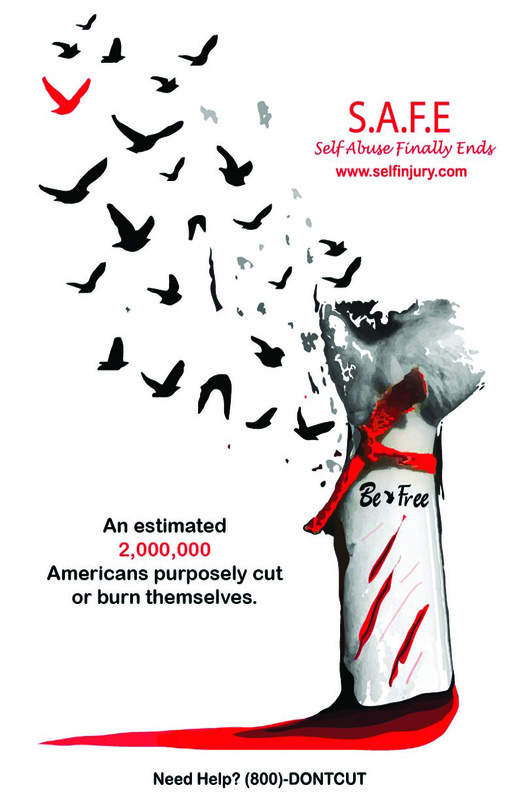 March is self injury awareness month in the United States, Canada, and Western Europe. There are two-million cases, mostly youth, reported annually in the United States. The stigma of self-injury needs to be broken. Warning: this article may contain emotional triggers. Self-injury, sometimes called self-harm, is any deliberate, non-suicidal behaviour that inflicts physical injury to your body. Self-harm by itself isn't suicidal behaviour. But if the emotional distress that causes self-injury continues, it can cause suicidal thoughts. Self-injury is an attempt at instant relief from an emotional pain. We often think of cutting when it comes to self-injury, but self-injury includes actions like burning, pulling hair out in clumps, breaking bones, scratching, bruising, and drinking something harmful like bleach. The physical pain of self-harm is often easier to deal with than the emotional pain behind it. Self-injury is a coping mechanism. It can help you deal with intense emotional distress by creating a calming sensation or the feeling that you have control of a situation. It's also real pain. You can see the injury and know why it's hurting as opposed to emotional pain. Self-injury happens across all genders, races, beliefs and ages. According to the organization Healthy Place, one in five women and one in five men engage in self-injury. Some 90 per cent of self-harm starts in adolescence, usually around age 14 and continues into the 20s. It may even continue or start later in life. Because self-injury is more common among girls, it's led to the gender based stigma that girls who self injure are attention seekers. How do you help someone who self-injures? Deny the problem. It's not the person's problem or just one of his/her 'things'. It's not a fad, social statement or a phase he/she will grow out of. Stay calm. Freaking out won't solve anything. It will just close all lines of communication. Talk. Be non-judgmentally supportive. Ask "Why are you doing this to yourself?" Take the problem seriously. It's not about attention-seeking or a growing pain. Seek treatment. Accompany the person to the doctor or counsellor but don't be pushy about privacy.